Pooja Chandrashekar is the Founder and CEO of ProjectCSGIRLS, a national competition for middle school girls intended to inspire them to learn more about the exciting opportunities available to them in computer science and STEM. Her biggest passion is encouraging girls in technology and STEM, for which she has founded and leads several initiatives, including the Fairfax Math Circle for Middle School Girls at George Mason University and the NCWIT AspireIT program “Game Programming with Microsoft Kodu”. This year, she was selected as a National Winner of the NCWIT Award of Aspirations in Computing and as a she++ #include Fellow. 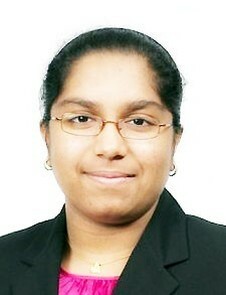 In the future, Pooja aspires to pursue a career at the nexus of medicine, computer science, and tech entrepreneurship. Pooja Chandrashekar: I’m currently a senior at Thomas Jefferson High School for Science and Technology in Alexandria, VA and my interests lie at the intersection of computer science and medicine, particularly in interdisciplinary fields such as computational neuroscience. I’ve lived in Northern Virginia all my life and have grown up in an environment that has always emphasized the importance of STEM and independent discovery. My parents are both engineers so I’m fortunate enough to have always had role models to look up to. I developed a keen interest in science from a young age tinkering with build-it-yourself kits and watching science documentaries, so in middle school it was only natural for me to start experimenting with different kinds of research. I was lucky to go to a middle school that included computer science in its curriculum, something which sparked my love for programming through web design, robotics, and game programming. I carried my passion over into high school, taking AP Computer Science my freshman year, Artificial Intelligence my junior year, and Parallel Computing my senior year. In high school, I’ve discovered a real love for research, have worked as a research intern at the MITRE Corporation for two summers working on geolocation research one summer and mild traumatic brain injury research the other, and have conducted extensive independent research as well. However, apart from research and academics, I’m most passionate about encouraging girls in technology and have founded various initiatives to do, including ProjectCSGIRLS, the AspireIT program “Game Programming with Microsoft Kodu”, and the Fairfax Math Circle for Middle School Girls. For my outreach work and computing-related interests, this year I was selected as one of 35 recipients of the 2014 NCWIT National Award for Aspirations in Computing and as one of 30 recipients of the Stanford She++ #include Fellowship. In the future, I intend to pursue a career at the intersection of medicine, computer science, and tech entrepreneurship. Women LEAD: You are the Founder of ProjectCSGIRLS, which aims to inspire more girls to learn and develop a passion for computer science. Can you tell us more about ProjectCSGIRLS and its impact? Pooja Chandrashekar: I founded ProjectCSGIRLS the summer after my sophomore year as a response to the growing gender gap in the technology fields.ProjectCSGIRLS is a national initiative meant to encourage girls in technology and computer science through a hands-on competition that challenges middle school girls to come up with novel solutions to imminent social problems. Participants can build, code, or prototype their projects and must address one of three themes: global health, security, or intelligent technology. They are then required to submit a technical report of their project components and results, as well as a video describing why their product is innovative and useful. We want to target the critical middle school period and empower the girls who participate in our program by showing them that they can be the innovative technology leaders of tomorrow. Last year, we held our inaugural competition for middle school girls in only VA, MD, and DC and were able to reach over 100 girls through our program. The projects we saw were incredible, ranging from machine learning algorithms for speech analysis to cybersecurity genetic algorithms. The 2014 ProjectCSGIRLS Awards Gala featured guest speakers, participants’ projects on display, and other activities, attracting over 130 attendees and immense support from the community and from tech companies. This year, I decided to expand ProjectCSGIRLS to a national scale in order to reach hundreds more middle school girls from all over the country. I now have an Executive Team, Outreach Team, and Board of Directors working with me to reach this goal. In June of 2015, we will be hosting a national gala event to honor the winners of the 2015 ProjectCSGIRLS competition. The event will be in DC and will feature tech company tours, guest speakers, workshops, and other activities to show the girls how incredible computer science can be. We’re also partnering with a number of national and global organizations promoting women in technology to help us bring the program national and host the national gala. Women LEAD: Why does empowering girls pursuing technology-related paths matter to you? Pooja Chandrashekar: It was in my freshman APCS class that I realized I was one of three girls in the class and the only freshman girl. And this was in a school as focused on science and tech as mine and which on the overall has a very equal gender ratio. This disturbing observation continued into higher level math and computing classes, making it quite a prominent part of my time in high school and was what motivated my work to empower girls in technology-related paths. My work stems from the fact that I don’t want any girl in future generations to shy away from computing because she feels out of place or incapable. I’ve experienced the gender gap first hand and I know how discouraging it can be. If women make up 50% of the population, then we should see that same statistic in every field of study, including computer science. Diversity is key to making a product or building a company that can best address the needs of every member in the community and we need to make increasing that diversity a priority. I’m a strong believer in the power of computing to change our world and I want to see more women joining in that movement and becoming a part of the technological revolution. Women LEAD: In addition, you founded and lead the Fairfax Math Circle for Middle School Girls at George Mason University. Can you tell us more about this project and your experiences? Pooja Chandrashekar: I co-founded the Fairfax Math Circle for Middle School Girls three years ago and have been leading it since. In high school, I noticed that there were very few girls taking advanced math classes or even who just liked math, so this was a way I could show middle school girls how fun and interesting math could be. We meet every week during the school year at George Mason University to discuss interesting math and computing related topics and different problem-solving approaches. At the end, they come away with a sense of how creative the field is and a real desire to learn more than just what is taught in the traditional school curriculum. Women LEAD: What motivates you to keep fighting for gender equality in tech industries? Pooja Chandrashekar: The satisfaction I get from working on ProjectCSGIRLS or in running my AspireIT program is indescribable. Showing these young girls how creative they can be and seeing them go off and use their newly learned skills to develop products, games, or apps is incredible. Computer science is quickly becoming applicable to every field of study so it’s important that every student be equipped with the necessary knowledge. I’m motivated to keep doing what I’m doing because it’s what I’m passionate about and because I know that it will make a difference to so many. It’s so gratifying to have parents come up to me and tell me how much of an impact my work made on their daughter’s life. In addition, it’s also great to see the tech community responding to work like mine by releasing diversity statistics, passing legislation, and starting new initiatives to support women in tech. We’re making progress and that always keeps me motivated. Pooja Chandrashekar: My mom! She has taught me the importance of hard work and dedication, as well as how critical education is to success. Without her support and encouragement, I couldn’t have been what I am today. She is an incredibly resilient and strong person and constantly reminds me to push myself and think beyond the boundaries. She’s always told me that nothing should stop me from pursuing my dreams and has always been there for me. I don’t think anyone has or will impact me in my life as much as her. Women LEAD: What advice do you have for future entrepreneurs and women leaders? Pooja Chandrashekar: Don’t give up. There will certainly be times when it looks like everything won’t work out and it looks like you’re headed towards failure, but trust in your ideas and stay focused. Work as hard as you possibly can and make sure you’re passionate about what you’re doing. Passion is everything to an entrepreneur. Also make sure you surround yourself with great mentors who can guide you and offer valuable advice. And if you fail, remember that it’s absolutely okay. Pick yourself up and keep moving forward. I started ProjectCSGIRLS with no background in founding an organization and I consider it one of the best decisions I ever made. If you’ve got the idea and the drive, nothing can stop you.